The U.S. Environmental Protection Agency (EPA) defines a pesticide as "any substance or mixture of substances intended for preventing, destroying, repelling, or lessening the damage of any pest." A pesticide may be a chemical substance, biological agent (such as a virus or bacteria), antimicrobial, disinfectant or device used against pests including insects, plant pathogens, weeds, mollusks, birds, mammals, fish, nematodes (roundworms) and microbes that compete with humans for food, destroy property, spread or are a vector for disease or are a nuisance. Many pesticides are poisonous to humans. 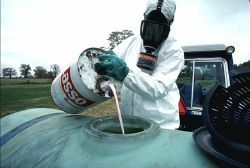 Pesticides can also be classed as synthetic pesticides or biological pesticides, although the distinction can sometimes blur. A systemic pesticide moves inside a plant following absorption by the plant. This movement is usually upward (through the xylem) and outward. Increased efficiency may be a result. Systemic insecticides which poison pollen and nectar in the flowers may kill needed pollinaters. Since before 2500 B.C.E., humans have used pesticides to prevent damage to their crops. The first known pesticide was elemental sulfur dusting used in Sumeria about 4,500 years ago. By the 15th century, toxic chemicals such as arsenic, mercury and lead were being applied to crops to kill pests. In the 17th century, nicotine sulfate was extracted from tobacco leaves for use as an insecticide. The 19th century saw the introduction of two more natural pesticides, pyrethrum which is derived from chrysanthemums, and rotenone which is derived from the roots of tropical vegetables. In 1939, Paul Müller discovered that DDT was a very effective insecticide. It quickly became the most widely-used pesticide in the world. However, in the 1960s, it was discovered that DDT was preventing many fish-eating birds from reproducing which was a huge threat to biodiversity. Rachel Carson wrote the best-selling book Silent Spring about biological magnification. DDT is now banned in at least 86 countries, but it is still used in some developing nations to prevent malaria and other tropical diseases by killing mosquitoes and other disease-carrying insects. In most countries, in order to sell or use a pesticide, it must be approved by a government agency. For example, in the United States, the EPA does so. Complex and costly studies must be conducted to indicate whether the material is effective against the intended pest and safe to use. During the registration process, a label is created which contains directions for the proper use of the material. Based on acute toxicity, pesticides are assigned to a Toxicity Class. "Read and follow label directions" is a phrase often quoted by extension agents, garden columnists and others teaching about pesticides. This is not merely good advice; it is the law, at least in the U.S. Similar laws exist in limited parts of the rest of the world. The Federal Insecticide, Fungicide, and Rodenticide Act of 1972 (FIFRA) set up the current system of pesticide regulations. It was amended somewhat by the Food Quality Protection Act of 1996. Its purpose is to make pesticide manufacture, distribution, and use as safe as possible. The most important points for users to understand are these: it is a violation to apply any pesticide in a manner not in accordance with the label for that pesticide, and it is a crime to do so intentionally. Pesticides have been found to pollute virtually every lake, river and stream in the United States, according to the US Geological Survey. Pesticide runoff has been found to be highly lethal to amphibians, according to a study by the University of Pittsburgh. Pesticide impacts on aquatic systems are often studied using a hydrology transport model to study movement and fate of chemicals in rivers and streams. As early as the 1970s quantitative analysis of pesticide runoff was conducted in order to predict amounts of pesticide that would reach surface waters. Pesticides are strongly implicated in pollinator decline, including through the mechanism of Colony Collapse Disorder. Nitrogen fixation, which is required for the growth of higher plants, is hindered by pesticides in soil. The insecticides DDT, methyl parathion, and especially pentachlorophenol have been shown to interfere with legume-rhizobium chemical signaling. Root nodule formation in these plants saves the world economy $10 billion in synthetic nitrogen fertiliser every year. The use of pesticides also decreases the general biodiversity in the soil. Not using them results in higher soil quality with the additional effect that more life in the soil allows for higher water retention. This helps increase yields for farms in drought years, when organic farms have had yields 20-40 percent higher than their conventional counterparts. A study published by the United States National Research Council in 1993 determined that for infants and children, the major source of exposure to pesticides is through diet. A recent study in 2006 measured the levels of organophosphorus pesticide exposure in 23 school children before and after replacing their diet with organic food (food grown without synthetic pesticides). In this study it was found that levels of organophosphorus pesticide exposure dropped dramatically and immediately when the children switched to an organic diet . The Pesticide Data Program started by the United States Department of Agriculture is the largest tester of pesticide residues on food sold in the United States. It began in 1990, and has since tested over 60 different types of food for over 400 different types of pesticides - with samples collected close to the point of consumption. In 2016, over 99 percent of the samples tested had residues well below the tolerances established by the EPA, with 23 percent having no detectable pesticide residue. Pesticides can present danger to consumers, bystanders, or workers during manufacture, transport, or during and after use. There is concern that pesticides used to control pests on food crops are dangerous to the consumer. These concerns are one reason for the organic food movement. Many food crops, including fruits and vegetables, contain pesticide residues after being washed or peeled (see Pesticide residues in food, above). Residues, permitted by US government safety standards, are limited to tolerance levels that are considered safe, based on average daily consumption of these foods by adults and children (as opposed to an upper bound). The remaining exposure routes, in particular pesticide drift, are potentially significant to the general public  Risk of exposure to pesticide applicators, or other workers in the field after pesticide application, may also be significant and is regulated as part of the pesticide registration process. Children have been found to be especially susceptible to the harmful effects of pesticides. A number of research studies have found higher instances of brain cancer, leukemia, and birth defects in children with early exposure to pesticides. Peer-reviewed studies now suggest neurotoxic effects on developing animals from organophosphate pesticides at legally-tolerable levels, including fewer nerve cells, smaller birth weights, and lower cognitive scores. The EPA finished a ten year review of the organophosphate pesticides following the 1996 Food Quality Protection Act, but did little to account for developmental neurotoxic effects, drawing strong criticism from within the agency and from outside researchers. Pesticides inflict extremely widespread damage to biota, and many countries have acted to discourage pesticide usage through their Biodiversity Action Plans. Misuse of pesticides can also cause pollinator decline, which can adversely affect food crops. An early discovery relating to pesticide use, is that pests may eventually evolve to become resistant to chemicals. When sprayed with pesticides, many pests will initially be very susceptible. However, not all pests are killed, and some with slight variations in their genetic make-up are resistant and therefore survive. Through natural selection, the pests may eventually become very resistant to the pesticide. Farmers may resort to increased use of pesticides, exacerbating the problem. ‘'Persistent Organic Pollutants’' (POPs) are one of the lesser-known environmental issues raised as a result of using pesticides. POPs may continue to poison non-target organisms in the environment and increase risk to humans by disruption in the endocrine system, cancer, infertility and mutagenic effects, although very little is currently known about these ‘chronic effects’. Many of the chemicals used in pesticides are persistent soil contaminants, whose impact may endure for decades, and adversely affect soil conservation. A study conducted by the Harvard School of Public Health in Boston, has discovered a 70 percent increase in the risk of developing Parkinson’s disease for people exposed to even low levels of pesticides. Some uncontrolled pests can cause serious consequences; a person bitten by mosquitoes that carry disease like West Nile virus and malaria may die. A child stung by bees, wasps or ants may suffer an allergic reaction. Animals infected by parasites or fleas may suffer severe illness. Moldy food or diseased produce may cause sickness. Roadside trees and brush may block visibility and cause accidents. Invasive weeds in parks and wilderness areas may cause environmental damage. Pesticides are used in grocery stores and food storage facilities to manage rodents and insects associated with food and grain. Each use of a pesticide carries some associated risk. Proper pesticide use decreases these associated risks to an acceptable level and increases quality of life, protects property, and promotes a better environment. Pest resistance to a pesticide is commonly managed through pesticide rotation. Rotation involves alternating among pesticide classes with different modes of action to delay the onset of or mitigate existing pest resistance. Different pesticide classes may be active on different pest sites of action. The U.S. Environmental Agency (EPA or USEPA) designates different classes of fungicides, herbicides, and insecticides. Pesticide manufacturers may, on product labeling, require that no more than a specified number of consecutive applications of a pesticide class be made before alternating to a different pesticide class. This manufacturer requirement is intended to extend the useful life of a product. Tank mixing pesticides is the combination of two or more pesticides with different modes of action. This practice may improve individual pesticide application results in addition to the benefit of delaying the onset of or mitigating existing pest resistance. Pesticides are often very cost-effective for farmers. Pesticide safety education and pesticide applicator regulation are designed to protect the public from pesticide misuse, but do not eliminate all misuse. Reducing the use of pesticides and replacing high risk pesticides is the ultimate solution to reducing risks placed on our society from pesticide use. For over 30 years, there has been a trend in the United States and in many other parts of the world to use pesticides in combination with alternative pest controls. This use of integrated pest management (IPM) is now commonplace in US agriculture. With pesticide regulations that now put a higher priority on reducing the risks of pesticides in the food supply and emphasize environmental protection, old pesticides are being phased out in favor of new reduced risk pesticides. Many of these reduced risk pesticides include biological and botanical derivatives and alternatives. As a result, older, more hazardous, pesticides are being phased out and replaced with pest controls that reduce these health and environmental risks. Chemical engineers continually develop new pesticides to produce enhancements over previous generations of products. In addition, applicators are being encouraged to consider alternative controls and adopt methods that reduce the use of chemical pesticides. This process is on-going and is not an immediate solution to the risks of pesticide use. In 2006, the World Health Organization suggested the resumption of the limited use of DDT to fight malaria. They called for the use of DDT to coat the inside walls of houses in areas where mosquitoes are prevalent. Dr. Arata Kochi, WHO's malaria chief, said, "One of the best tools we have against malaria is indoor residual house spraying. Of the dozen insecticides WHO has approved as safe for house spraying, the most effective is DDT." ↑ What is a Pesticide?. (US EPA definitions). Retrieved April 10, 2019. ↑ G. Tyler Miller, Jr., Living in the Environment (Stamford, CT: Wadsworth/Thomson Learning, 2002, ISBN 0534997287). ↑ Elizabeth Miller, DDT-resistant Mosquitoes Spread Malaria: Controversial insecticide is still used in the third world MosquitoReviews.com, 2012. Retrieved October 10, 2018. ↑ Introduction to Pesticide Labels. United States Environmental Protection Agency. Retrieved October 10, 2018. ↑ Pesticides in the Nation’s Streams and Ground Water, 1992–2001 US Geological Survey, March 2006. Retrieved October 15, 2018. ↑ Roundup®highly lethal to amphibians, finds University of Pittsburgh researcher University of Pittsburgh Medical Center, 2005. Retrieved October 15, 2018. ↑ C.M. Hogan, Leda Patmore, Gary Latshaw, Harry Seidman et al., Computer modeling of pesticide transport in soil for five instrumented watersheds (Sunnyvale, CA: ESL Inc., 1973). ↑ Matt Wells, Vanishing bees threaten US crops BBC News, 2007. Retrieved October 10, 2018. ↑ J.E. Fox, J. Gulledge, E. Engelhaupt, M.E. Burrow & J.A. McLachlan, "Pesticides reduce symbiotic efficency of nitrogen-fixing rhizobia and host plants" PNAS 104 (2007):10282-7. ↑ A. E. Johnston, "Soil organic-matter, effects on soils and crops" Soil Use Management 2 (1986):97-105. ↑ D. W. Lotter, R. Seidel & W. Liebhardt, "The performance of organic and conventional cropping systems in an extreme climate year" American Journal of Alternative Agriculture 18 (2003):146-154. ↑ Polyxeni Nicolopoulou-Stamati, et al., Chemical Pesticides and Human Health: The Urgent Need for a New Concept in Agriculture. Front Public Health 4 (2016): 148. Retrieved October 12, 2018. ↑ Jaga K., C. Dharmani, Sources of exposure to and public health implications of organophosphate pesticides Pan Am J Public Health 14(3) (2003): 171–185. ↑ D.J. Ecobichon, "Toxic effects of pesticides." In: Casarett and Doull's Toxicology: The Basic Science of Poisons. Klaassen CD, Doull J., (eds.). (New York, NY: MacMillan, 1996). ↑ TA Arcury, SA Quandt, BG Mellen, An exploratory analysis of occupational skin disease among Latino migrant and seasonal farmworkers in North Carolina. Journal of Agricultural Safety and Health 9(3) (2003):221–232. ↑ MA O'Malley, Skin reactions to pesticides. Occupational Medicine 12 (1997): 327–345. ↑ J.L. Daniels, A.F. Olshan, D.A. Savitz, Pesticides and childhood cancers. Environmental Health Perspectives 105 (1997): 1068–1077. ↑ J.A. Firestone, T. Smith-Weller, G. Franklin, P. Swanson, W.T. Longsteth, H. Checkoway, Pesticides and risk of Parkinson disease: a population-based case-control study. Archives of Neurology 62(1) (2005): 91–95. ↑ D.H. Cordes, D.F. Rea, Health hazards of farming. American Family Physician 38 (1988):233–243. ↑ R. Das, A. Steege, S. Baron, J. Beckman, R. Harrison, Pesticide-related illness among migrant farm workers in the United States. Int J Occup Environ Health 7 (2001):303–312. ↑ B. Eskenazi, A. Bradman, R. Castorina Exposures of children to organophosphate pesticides and their potential adverse health effects. Environmental Health Perspectives 107(3) (1999): 409–419. ↑ A.M. Garcia, Pesticide exposure and women's health. American Journal of Industrial Medicine 44(6) (2003): 584–594. ↑ M. Moses, Pesticide-related health problems and farmworkers. AAOHN 37 (1989): 115–130. ↑ D.A. Schwartz, L.A. Newsum, R.M. Heifetz, Parental occupational and birth outcome in an agricultural community. Scandinavian Journal of Work, Environment & Health 12 (1986):51–54. ↑ L. Stallones, C. Beseler, Pesticide illness, farm practices, and neurological symptoms among farm residents in Colorado. Environ Res 90 (2002):89–97. ↑ L.L. Strong, B. Thompson, G.D. Coronado, W.C. Griffith, E.M. Vigoren, I. Islas, Health symptoms and exposure to organophosphate pesticides in farmworkers. Am J Ind Med 46 (2004):599–606. ↑ G. Van Maele-Fabry, J.L. Willems, Occupation related pesticide exposure and cancer of the prostate: a meta-analysis. Occupational and Environmental Medicine 60(9) (2003): 634–642. Retrieved October 12, 2018. ↑ M.C. Alavanja, J.A. Hoppin, F. Kamel, Health effects of chronic pesticide exposure: cancer and neurotoxicity. Annu Rev Public Health 25 (2004):155–197. ↑ F. Kamel, J.A. Hoppin, Association of pesticide exposure with neurologic dysfunction and disease. Environ Health Perspect 112 (2004):950–958. ↑ National Research Council, Pesticides in the Diets of Infants and Children. (Washington, DC: National Academies Press, 1993, ISBN 0309048753). ↑ Chensheng Lu, et al., Organic Diets Significantly Lower Children’s Dietary Exposure to Organophosphorus Pesticides. Environmental Health Perspectives 114(2) (2006):260-263. Retrieved October 12, 2018. ↑ Pesticide Data Program United States Department of Agriculture. Retrieved October 12, 2018. ↑ Pesticide Data Program: Annual Summary, Calendar Year 2016 United States Department of Agriculture, February 2018. Retrieved October 12, 2018. ↑ Occupational Pesticide Safety and Health. EPA. Retrieved October 15, 2018. ↑ Christine L. Rabideau, Multiple Pesticide Exposure: Immunotoxicty And Oxidative Stress. EPA, 2001. Retrieved October 15, 2018. ↑ Pesticide Drift. National Pesticide Information Center. Retrieved October 15, 2018. ↑ Katherine Noyes, Banish Pesticides from your Garden. Retrieved October 15, 2018. ↑ James R. Roberts and Catherine J. Karr, Pesticide Exposure in Children Pediatrics 130(6) (December 2012). Retrieved October 15, 2018. ↑ Melissa Lee Phillips, Registering Skepticism: Does the EPA's Pesticide Review Protect Children? Environmental Health Perspectives 114(10) (2006): A592–A595. Retrieved October 15, 2018. ↑ A.E. Muckenfuss, B.M. Shepard, and E.R. Ferrer, Natural Mortality of Diamondback Moth in Coastal South Carolina. Clemson University, Coastal Research and Education Center. Retrieved October 15, 2018. ↑ Roxanne Khamsi, Pesticide exposure raises risk of Parkinson’s New Scientist, June 26, 2006. Retrieved October 15, 2018. ↑ The Benefits of Pesticides, A Story Worth Telling. Purdue University. Retrieved October 15, 2018. ↑ WHO gives indoor use of DDT a clean bill of health for controlling malaria World Health Orgainzation, September 15, 2006. Retrieved October 15, 2018. Alarcon, Walter A., et al. "Acute Illnesses Associated With Pesticide Exposure at Schools." Journal of the American Medical Association 294 (July 2005):455–465. Anderson, D.W., J.J. Hickey, R.W. Risebrough, D.F. Hughes, and R.E. Christensen. "Significance of chlorinated hydrocarbon residues to breeding pelicans and cormorants." The Canadian Field-Naturalist 83 (1969):91–112. Greene, Stanley A., and Richard P. Pohanish (eds.). Sittig's Handbook of Pesticides and Agricultural Chemicals. SciTech Publishing, Inc., 2005. ISBN 0815515162. Hamilton, Denis, and Stephen Crossley (eds.). Pesticide residues in food and drinking water. J. Wiley, 2004. ISBN 0471489913. Hond, Frank, et al. Pesticides: problems, improvements, alternatives. Blackwell Science, 2003. ISBN 0632056592. Kegley, Susan E., and Laura J. Wise. Pesticides in fruits and vegetables. University Science Books, 1998. ISBN 0935702466. Miller, G. Tyler, Jr. Living in the Environment, 12th ed. Belmont: Wadsworth/Thomson Learning, 2002. ISBN 0534376975. Watson, David H. (ed.). Pesticide, veterinary and other residues in food. Woodhead Publishing, 2004. ISBN 1855737345. Ware, George W., and David M. Whitacre. Pesticide Book. Meister Publishing Co., 2004. ISBN 1892829118. National Pesticide Information Center (NPIC) - Objective, science-based information about pesticide-related topics. Northwest Coalition for Alternatives to Pesticides - Resource on pesticide hazards and alternatives. Compendium of Pesticide Common Names - Maintained by Alan Wood. Pesticide Action Network UK Aims to minimize pesticide use. PAN Pesticide Database - Compilation of multiple regulatory databases into a web-accessible form. Crop Life America - US trade association representing the crop protection and pest control industry. 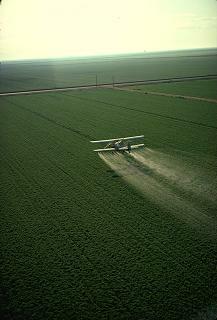 Pesticides - United States Environmental Protection Agency. Pesticides: Use, Effects, and Alternatives to Pesticides in Schools (pdf) from the United States General Accounting Office. This page was last modified on 10 April 2019, at 15:56.